Free Download Casio EX-ZR400 PDF User Manual, Instructions, User Guide, Owner's Manual. 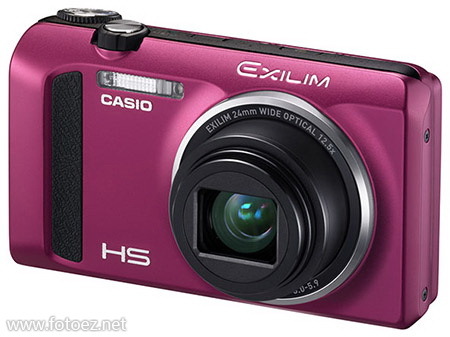 Casio Exilim EX-ZR400 is a high speed compact camera offers 0.99 Sec. start-up time, 0.14 Sec. AF time, 0.015 Sec release time lag, 0.26Sec. shooting interval and 30fps high-speed continuous shooting. It houses a 12.5x (24-300mm) optical zoom lens let you capture even fleeting moments anywhere at the touch of a button. The 16.1 MP BSI-CMOS sensor captures bright, beautiful photos even under extremely low-light conditions. The EX-ZR400 makes photography great fun any time, any where. With the adoption of the latest EXILIM Engine HS 3, the EX-ZR400 offers high-speed shooting capability, with a ready for use in approximately 0.99 seconds, a high-speed auto focus of 0.14 seconds and as little as 0.26 second shooting between frames. You never have to miss an unexpected shooting opportunity. The EX-ZR400 equipped with a high-sensitivity 16.1-megapixels back-illuminated CMOS sensor, this high performance sensor does not only allow you to take bright, smooth, high-quality images, but also edit, enlarge and print out sections of a photo - in outstanding quality and with no loss of image detail. EX-ZR400 sport a 12.5x (24-300mm) optical zoom lens can bring even the most distant subjects right up close, while the CMOS-shift image stabilization automatically reduces blurring. EXILIM EX-ZR400 offers high-speed continuous shooting up to 30 fps at full resolution, it offers distance shooting performance exceeding that of SLR cameras and the ability to capture fast-moving subjects in crucial moments, you never miss a photo opportunity. ZR400 features the Triple Shot function shoots a burst of three images and stores them in the memory. The feature not only takes an image when the shutter button is pressed, but also captures images immediately before and after. As a result, Triple Shot enables users to capture decisive moments with quickly moving subjects such as children and pets. EXILIM EX-ZR400 can capture brilliant 1920x1080 full-HD video with stereo sound and use 12.5x optical zoom. While recording movies you can continue to take photos. The ZR400 features a large, bright 3.0-inch super clear LCD screen that permits viewing from almost any angle. The new inset display enables the user to review shots shown in part of the LCD while taking photos. The All-In-Focus Macro function which selects only in-focus areas from continuously shot images at different focus settings to produce a composite image, that ensures well-focused photos by keeping every area of the shot in focus from close-up subjects to far-away backgrounds, which are hard to produce using a conventional camera. The Premium AUTO PRO function automatically analyzes the shooting scene to choose the best settings and perform image processing. It automatically combines images from high-speed burst shooting according to shooting conditions to create gorgeous photos. Thanks to the original power-saving technology and algorithm optimization created by Casio, the EXILIM EX-ZR400 offers long battery life enabling 515 images to be taken on a single charge. This performance takes the worry out of extended picture taking, especially on a trip. Capture of about 515 images on a single charge.